Explanation: Runaway stars are massive stars traveling rapidly through interstellar space. Like a ship plowing through cosmic seas, runaway star Alpha Cam has produced this graceful arcing bow wave or bow shock - moving at over 60 kilometers per second and compressing the interstellar material in its path. The bright star above and left of center in this wide (3x2 degree) view, Alpha Cam is about 25-30 times as massive as the Sun, 5 times hotter (30,000 kelvins), and over 500,000 times brighter. About 4,000 light-years away in the long-necked constellation Camelopardalis, the star also produces a strong wind. The bow shock stands off about 10 light-years from the star itself. What set this star in motion? 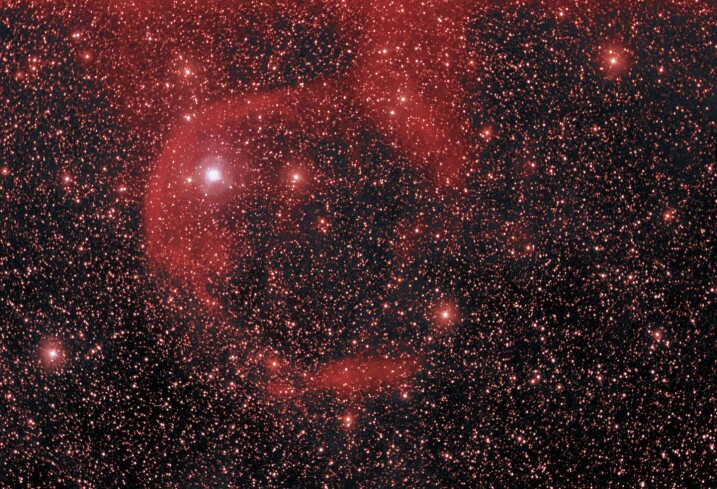 Astronomers have long thought that Alpha Cam was flung out of a nearby cluster of young hot stars due to gravitational interactions with other cluster members or perhaps by the supernova explosion of a massive companion star.